A durable anti-mould finish for areas subject to mould growth. 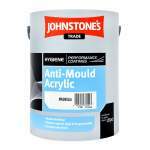 Johnstone's Trade Anti-Mould Acrylic is a durable, water-based, matt finish for interior walls and ceilings. A fungicide in the film coating prevents mould growth making it ideal for areas such as bathrooms and wetrooms. It is recoatable in 4-6 hours with coverage up to 11m²/L. Available in Brilliant White and Magnolia. All surfaces to be painted should be clean, dry and free from loose and flaking material. Rub down previously gloss painted surfaces with fine waterproof abrasive paper and rinse thoroughly. Avoid the inhalation of dust. Wear a suitable face mask when dry sanding. Surfaces contaminated with mould growth should be treated with Johnstone's Sterilisation Wash as directed. Stir well before use. Suitable for application by brush or roller. Also suitable for application by spray. Seal absorbent surfaces with a coat of Johnstone's Anti-Mould Acrylic thinned with up to 10% clean water. Do not apply in temperatures below 10°C or externally when rain is imminent. Johnstone's Anti-Mould Acrylic will cover approximately 9-11 square metres per litre depending on the nature and porosity of the surface being painted. Touch dry in 1-2 hours. Recoatable after 4-6 hours. Remove as much product as possible from application equipment before cleaning. Replace lid firmly. Clean equipment immediately after use with warm soapy water and rinse thoroughly. Some local authorities have special facilities for the disposal of waste coatings. Do not empty product into drains or watercourses. To avoid the risk of spillage, always store and transport in a secure upright position. Lift with care - gross weight does not exceed 8 kilograms. Do not use empty container for storing food.